Publishing a book, any book, is a fairly complex business. There’s the commissioning, writing, editing, illustrating, layout, design, proofreading, translating, printing, and so on. And making maps, cartography, is definitely a complex business. It combines science, aesthetics, technique, and even political and ideological questions, which is to say atlases present publishers with a particularly juicy set of challenges. This is especially true of those like our new thematic ones, which combine encyclopaedia-like content with maps. Competing powers may claim different borders in contested territories and places of conflict (for example in the Middle East). How do we map that place? And how do we name places where the ‘correct’ name is not clear? The ruling junta in Myanmar is not recognised by many nations, who continue to use the name Burma. And even if a name change is not contested, many older names for countries and regions remain in common use. If a place is officially called Krung Thep, but almost nobody knows or uses that name and continues to call it Saigon, what should we call it? Social attitudes affect map making, and always have. Our world is round, so who says which land masses should be shown at the top or centre of a flat map, and which way up? Who invented the conventions we use today and why? Early Renaissance maps show Jerusalem at the centre of the planet and the east at the top. (The east was said to be closer to God – Jerusalem being east of most European powers such as Spain, France and England.) Even the colour used in maps can foster ideas about the country being highlighted – wartime German cartographers coloured Europe a sickly, cowardly yellow and themselves a healthy and aggressive red. Some questions of how to draw maps are more technical and revolve around the map’s agenda: What are the physical traits we want to show (roads and land masses), and what abstract ones do we want to show (political boundaries)? What projection should we use? How far should we generalize the detail? Show many or few bends in a river? All the mountains or only those above a certain height? How much or how little detail will be confusing or clarifying for our school Geography learners? What does the curriculum say they need to understand and how can we draw maps to assist this? 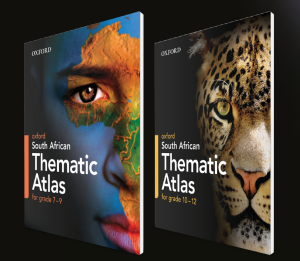 And finally, a constant question for our publishing team was how can we make school atlases that are simply a delight to pick up and page through? We would love you to look at how we tackled all this and let us know what you think.